Gary has nothing but praise for the operators but the limitations of the service are what got him involved in the HandyDART Riders’ Alliance. Gary got involved with the HandyDART Riders’ Alliance three years ago because of what he sees as system failures in scheduling and inflexibility due to underfunding. “The major problem with the service is the scheduling is cut too close to the bone… a lot of people are late and a lot of people get frustrated.” It’s so often late that Gary advises new riders to lie about their appointment times when booking rides. On top of all that, there’s limited evening service and it can be challenging even to travel to a neighbouring municipality. Even a simple trip to go to the Walmart in Maple Ridge is so logistically challenging that Gary only does it a few times a year. “it’s a fight to get out coming back because the buses in Maple Ridge shut down at seven, after that they use taxis or have to bring a bus out from another area but nothing is guaranteed.” Even between Vancouver and Burnaby there are only three trips per day. It’s not cheap either. 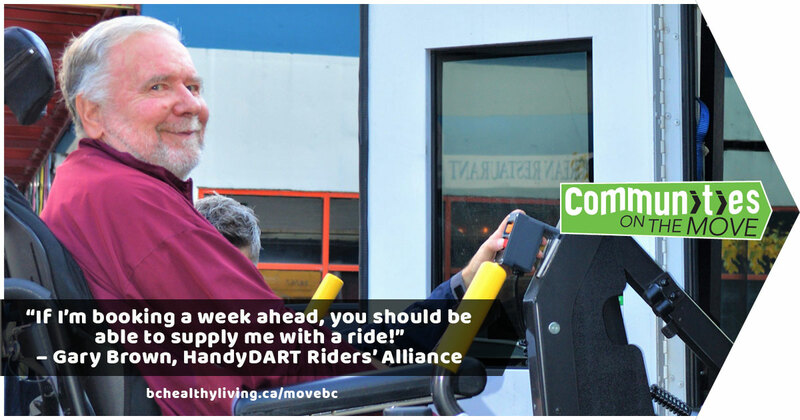 Gary spends $93 per month on HandyDART for a one zone pass which he tops up for cross-boundary rides. The transit pass for people on Disability Assistance does not apply to HandyDART either even though the people that use HandyDART are those that can’t use conventional transit. Although HandyDART is more expensive than conventional transit, it would be a mistake to call it a premium service. Riders like Gary rely on it. When he first got into his chair, he tried taking SkyTrain and the bus but it just didn’t work. People didn’t make room and he was often bumped. And with his MS, sometimes he can’t even lift his hand to tap his ComPASS (transit) card on the reader. People who don’t rely on HandyDART have choices when they need to get somewhere. Most able-bodied adults can walk, ride a bike, take transit, drive a car, take a taxi or catch a ride with someone else. But for people like Gary most other options are off the table, which makes HandyDART an essential service. This is why improving HandyDART is essential for getting Communities on the Move.